A New Year and Smile with Dental Implants in Allentown! Did you spend the last 12 months unhappy with the appearance of your teeth? Were you unable to carry out normal functions like eating and speaking clearly? 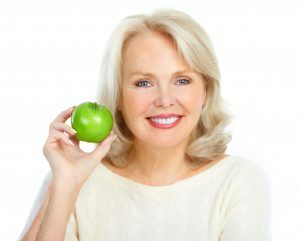 If so, then this is your year to be fully restored with either a dental crown, bridge or dental implants in Allentown. Read on to discover what each process can do for you! The crown of your tooth is the part that is visible above the gumline. Over time, it can become damaged or worn due to such occurrences as advanced decay, a break or bruxism (teeth grinding). Whether you’re suffering from one of the above symptoms or you’ve lost a tooth, having a crown added can restore both the functionality and aesthetic qualities you’ve been missing. Unlike times past, dental crowns are now available in tooth-colored options that can be shaded to match the appearance of your other teeth. Thus, you can now enjoy a fully functional and appealing smile. If you’re missing three or more teeth, then the dental bridge method is a valuable solution. A single fixture that consists of several tooth-colored, porcelain dental crowns, it is bonded to the surrounding teeth using dental cement. This form of restoration serves as a means to both regain the missing functionality and to prevent the remaining teeth from shifting. Thus, you’re able to avoid major occlusion (bite) problems down the road. For patients who desire the absolute best form of tooth replacement, the dental implant process is the answer. Your dentist will insert a titanium rod into the jawbone that acts as a replacement for the missing tooth root, eventually merging with the existing bone to form a sound foundation. After sufficient healing has transpired, an abutment and restoration will be added to fully rejuvenate your smile. You’ll enjoy better jawbone support by the implant being attached to the underlying bone. With proper care, you won’t have to worry about the fixture shifting. You’ll have a more realistic smile because the application mimics the natural stability created with the tooth root. To determine which method of restoration is best for you, reach out to your dentist in Allentown to schedule a consultation. The professional will thoroughly examine your current condition to make the best recommendation based on your needs and desires. The combination of being proactive and receiving top-notch treatment will result in a beautiful and functional smile to start the new year! Dr. Bradford G. Young is a graduate of the University of Pennsylvania Dental School. With well over a decade of experience in the dental field, he is able to provide his patients with compassionate and comprehensive care. A member of the Pennsylvania Dental Association and the Academy of General Dentistry, Dr. Young restores patients’ smiles at Bradford Young Family and Cosmetic Dentistry, and he can be reached for more information through his website. Comments Off on A New Year and Smile with Dental Implants in Allentown!